This Item is now Back in Stock, all colours have been upgraded — please ask us for photo if required until we have NEW IMAGES COMING SOON! 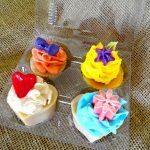 A set of 4 beautiful hand-made Soap Cupcakes that smell as good as they look. Pink is fragranced with Strawberry Champagne, Blue is Fresh Clean Cotton, Lemon is Lemon Myrtle, White is a gorgeous light floral such as Gardenia or Sweet Pea. We have many more Colours and decorations will differ, so the choice will be random unless you tell us your preference by Special Instructions in Paypal, or an email (see contact page). 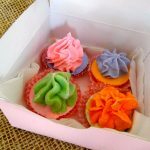 A set of 4 (Colours are Random unless you e-mail us with specific colours) beautiful hand-made Mini Soap Cupcakes that smell as good as they look. Pink is Strawberry Champagne, Blue is Fresh Clean Cotton, Lemon is Lemon Myrtle, Chocolate is Chocolate, White is a gorgeous light floral such as Gardenia or Sweet Pea, Orange is Orange/Tangerine, Purple is Lavender, Green is Jasmine. The Quinoa Protein Shampoo Bar and our beautiful new Hair Conditioning Bar combined in a box, perfect for a Gift, for Every day use, or for Travel purposes. All Natural & Organic Butters and Oils with wonderful conditioning ingredients, to give your hair that beautiful shine and bounce again! 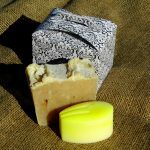 Our Shampoo Bar & Conditioner can also be purchased separately in the Organic Skin & Hair Care Page. 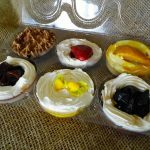 A fun pack of lovely fragrant Tart soaps: Strawberry Tart, BlueBerry Tart, Coconut Cream Pie, Lemon Meringue Pie, Chocolate Cream Pie and Pear & Custard Tart. Each soap weighs approx 75gms. The perfect Gift pack. 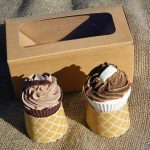 A gorgeous set of 6 novelty Chocolate Guest Soaps in a variety of fun shapes and fragrances: From Coconut Cream, Rasperry, Strawberry, Tangerine Orange, Jaffa, French Vanilla, Caramel, Toffee and of course Rich Dark and Milk Chocolate. 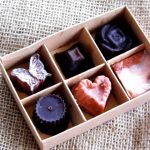 There are dozens of varieties, and each pack is a random mix of delicious soap chocolates. We’re sure you will be delighted and pleasantly surprised when you receive them. 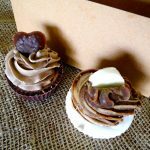 The perfect pack for the Chocoholic and a great gift for Dad!